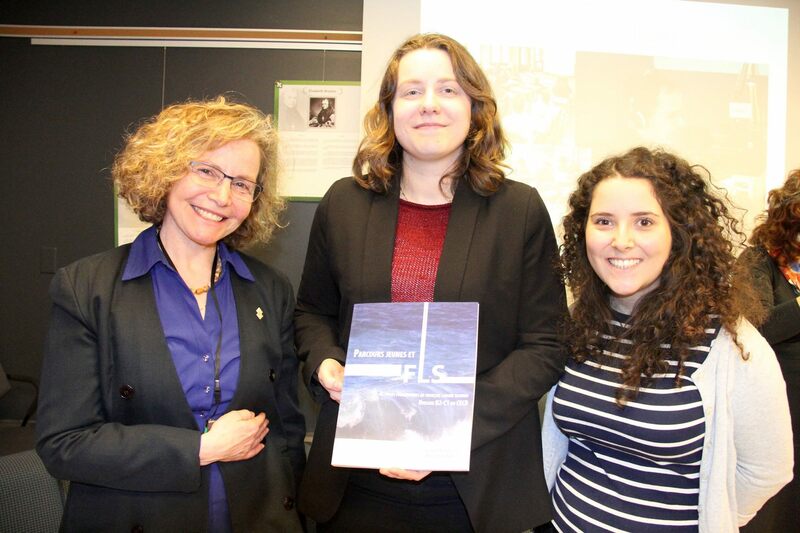 On March 29, 40 people gathered in the Carrefour francophone of the University of Ottawa to celebrate Parcours jeunes et FLS’s launch. Parcours jeunes et FLS is a French as a second language textbook that was created for B2 and C1 levels and published at the University of Ottawa Press (UOP). The authors, Laura Ambrosio and Miriam Hatabi, were present to discuss the book’s conception. Parcours jeunes et FLS is the result of an interinstitutional agreement between the Journalism Program of La Cité collégiale and OLBI, with the support of the Vice-President Academic and Provost and OLBI’s direction. Based on 18 journalistic reports prepared by students from La Cité, the book explores nine topical themes that affect youth from here and elsewhere. Each chapter includes complementary texts, activities based on the Common European Framework of Reference for Languages and the Framework of Reference for Pluralistic Approaches, round table activities on movies whose themes are related to the units, and 10 minute-podcasts. A DVD and a CD accompany the textbook. Parcours jeunes et FLS fills a need for representation of French linguistic minority communities. The textbook offers a vision for language teaching within a unique geographic context that also applies to the international francophonie. The book also fills a need for authentic teaching material. It is one of the few FLS textbooks that specifically target students at the B2-C1 levels. Have a look at the description of Parcours jeunes et FLS on the UOP’s website (in French only).